1. Why work with a Wealth Manager? A wealth manager constructs customized investment portfolios for his clients based upon their unique financial goals and objectives. A wealth manager’s primary responsible is to preserve and grow the wealth of his clients. 2. Why should I work with a boutique investment firm as opposed to a large brokerage? Working with a boutique investment firm ensures objective investment management services free from internal mandates or sales goals. This allows us to objectively select world class money managers while not being subject to a limited menu of investment selections. 3. Where will my assets be located? Our client’s assets are maintained at either Charles Schwab or TD Ameritrade. This ensures the safety and security of our client’s assets and enables them to control and access their accounts online or via customer service support 24 hours a day. 4. How does a fee-only Wealth Manager receive compensation? We receive compensation from our clients based upon a percentage of assets under management. This ensures that there is no commission conflict and aligns our interests with that of our clients. 5. What type of investments will my portfolio contain? Our client’s portfolios primarily contain institutional class mutual funds, exchange traded funds (ETF’s) and structured notes. 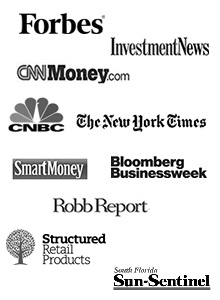 We attempt to select “world class” managers when constructing portfolios for our clients. 6. Will I be involved in the investment management decisions? Absolutely! Our clients are provided an Investment Policy Statement (IPS) which details how their assets are to be invested. Before and after investing their assets, our clients have the opportunity to make revisions to their Investment Policy Statement. 7. Why are individual stocks not used within your client’s portfolios? Due to the inherent risk of owning individual stocks, we improve the risk/return characteristics in our client’s portfolios through the use of institutional class mutual funds, exchange traded funds and structured notes. 8. How often will I meet with my Asset Manager? In addition to receiving monthly account statements from their custodian, our clients receive comprehensive quarterly performance reports from our firm. We meet with our clients throughout the year to review the performance of their portfolio as well as discuss any life changes or cash flow needs that require adjustments to their portfolio.